Coventry City have dismissed the prospect of an imminent move across the city to the Butts Park Arena, owned by Coventry Rugby Football Club. City, tenants to Premiership rugby side Wasps at the Ricoh Arena, are keen to develop their own home in the area. But the club said: "Reports linking us to any long-term deal with the rugby club is only speculation. "We're currently exploring all options in regards to a new stadium to secure the club's long-term stability." The statement added: "Coventry City Football Club are aware of recent media reports linking the club to a move to Butts Park Arena. We will not be making any further comment at this time." The Sky Blues' existing contract at the Ricoh Arena expires in August 2016. New managing director Chris Anderson, who took over last week, made it clear at his introductory press conference on Tuesday that he is open to all options as regards the promotion-chasing League One club's future home. However, he has also convened a meeting with Wasps about staying at the Ricoh. 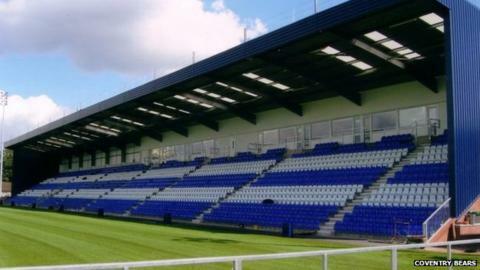 The 4,000-capacity Butts Park Arena, in the Spon End district of Coventry, close to the city centre, already has two teams playing there. The long-established Coventry RFC, once one of the foremost rugby union sides in England in their great amateur days, play in National League Division One, the third tier of the modern-day English pyramid. They have played their home games there since the stadium opened in 2004, when it also became home to the city's semi-professional rugby league side Coventry Bears, who play in Championship One, also at the third tier of the 13-man code.